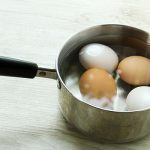 Your eggs should be in a single layer along the bottom of the pot. Fill the pot with enough cold water to cover the eggs by about 1 inch. Turn your stove on high and bring the water to a boil. This should only take a couple minutes, so watch your pot carefully! Take your pot off the hot burner as soon as your water starts boiling and put a lid on it. Don’t worry—the hot water will continue to boil the eggs. The amount of time your eggs need to cook depends on how you want them done. If you want soft-boiled eggs, which will have a runny yolk, set your timer for 3 minutes. 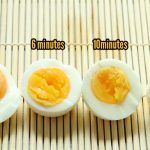 If you want medium boiled eggs, set your timer for 6 minutes. For a perfect hard-boiled egg, set your timer for at least 10 minutes. Everyone prefers their boiled eggs cooked differently. Once you’ve practiced a few times, you’ll figure out the perfect amount of cooking time for your tastes. Now that your boiled eggs are cooked, it’s time to peel them! This step is tricky. First, tap the eggs carefully to crack the shells in a few places. Place your eggs in a bowl of ice water. Submerge each egg completely, and leave them in the ice water for at least a minute. This cools the eggs and makes peeling the shells easier. Once your eggs have cooled off, they’re ready to peel. Take an egg out of the ice water and simply lift the shells off. You may not get the whole shell in one piece, but it should peel off cleanly. That’s all it takes to make a perfect boiled egg! You can eat your boiled eggs plain, or use them in a recipe, such as devilled eggs. Hard-boiled eggs make a great addition to salads and are a healthy, protein-rich snack, too.